What is so unique about the Tatcha Luminous Dewy Skin Mist? Is it just another spray bottle of water? You may wonder. For the price tag, it better be more than that! Well yes, it is more than just water. Tatcha calls this a “mist moisturizer” that I find a little odd. To those who might take it literally (and you’d be surprised at how many such people there are out there) they might spray this on and call it a day. What I find makes the Tatcha Luminous Dewy Skin Mist more unique than other facial mists, is that it feels “heavier” on skin, so more moisturizing than a regular water mist. It is formulated with botanical oils and humectants, to keep skin hydrated and also contains hyaluronic acid and Okinawa Red Algae to deliver hydration to skin. The liquid, which you can see in the bottom of the beautiful gradient coloured bottle, is a milky white. This is quite unlike the clear liquids of most facial mists, and reminds me a lot of the Pixi Hydrating Milky Mist. I must make special mention of the spray nozzle. The nozzle feels very solid, and sprays almost like a perfume bottle. The mist that is released is very very fine, and coats your skin like a veil. This feels at once comfortable and luxurious. It never feels like it’s dripping all down your face, nor does it feel like you’re splashing water on your skin. It feels like you’re walking into a cloud, little droplets of water sticking to your skin, refreshing your skin with each little burst. It is sublime! 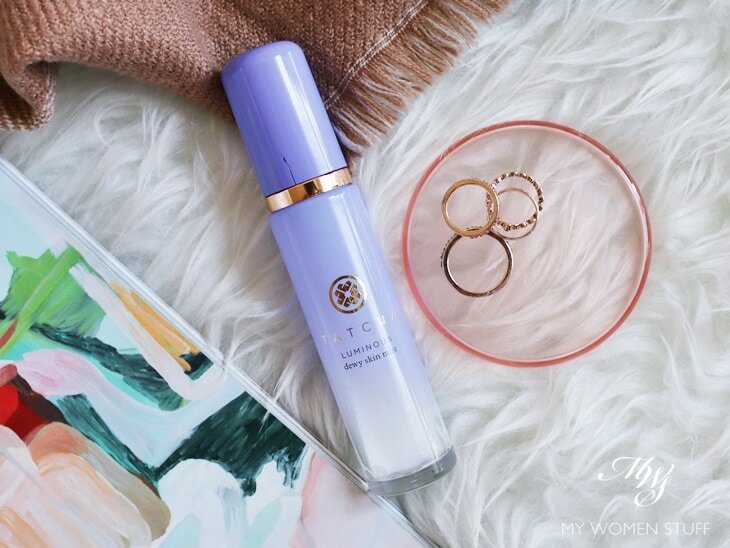 I have experienced products with good spray nozzles before this (Bobbi Brown Facial Mist and Pixi Hydrating Milky Mist come to mind) but none that feel as luxurious in hand, and on skin as this one from Tatcha. 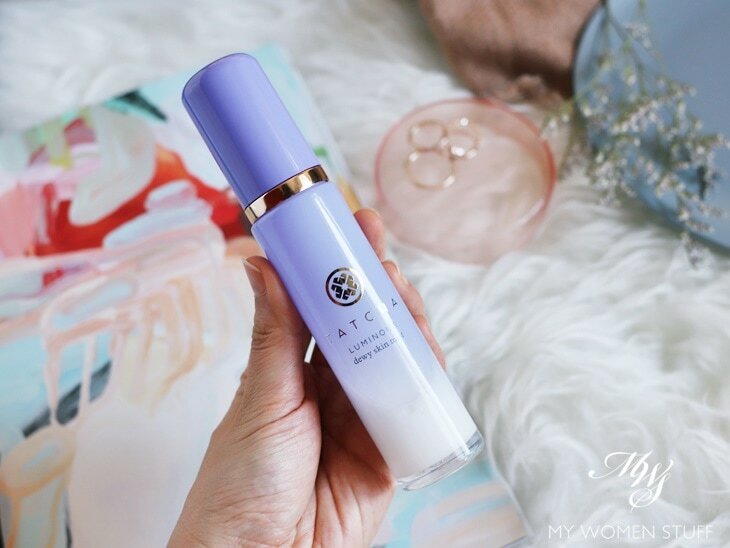 How does the Tatcha Luminous Dewy Skin Mist perform? I have dry skin, and for me, the Tatcha Luminous Dewy Skin Mist performs well. Each spray on my skin leaves it feeling moist, hydrated and comfortable. I use it quite liberally, and I use the moisture sandwich method to keep my skin well hydrated, so I do end up using quite a lot each time. When I’m at home, here in hot, humid Malaysia, I find that about 2 spritzes between my skincare is sufficient to keep my skin feeling hydrated and moisturised for most of the day. I also recently took it with me on vacation to a cooler climate, with much lower humidity, and I found that it helped my skin stay comfortable, hydrated and moisturized, despite the exposure to biting cold winds. I didn’t develop dry patches on my face at all, but my body was a wreck of itchy spots of dry skin! 😛 It isn’t 100% attributed to this spray of course, but it helped. Does it feel better than a water type mist e.g. Avene Thermal Water or even Caudalie Grape Water Mist? Yes it does. There is a little more “weight” to the liquid, and it does not evaporate as quickly. It makes skin feel perceptibly soft and moisturised the minute you spray it on. That said, while it is recommended for all skin types, I do think those with a drier skin type will benefit more from this Tatcha mist. If you have oily or combination type skin, you may find it “sticky” or that it leaves a residue. For me, I don’t feel that. But it must be said that I never let my skincare dry between layers, nor do I shy away from sticky, oily residue on my skin. The bottle is small. 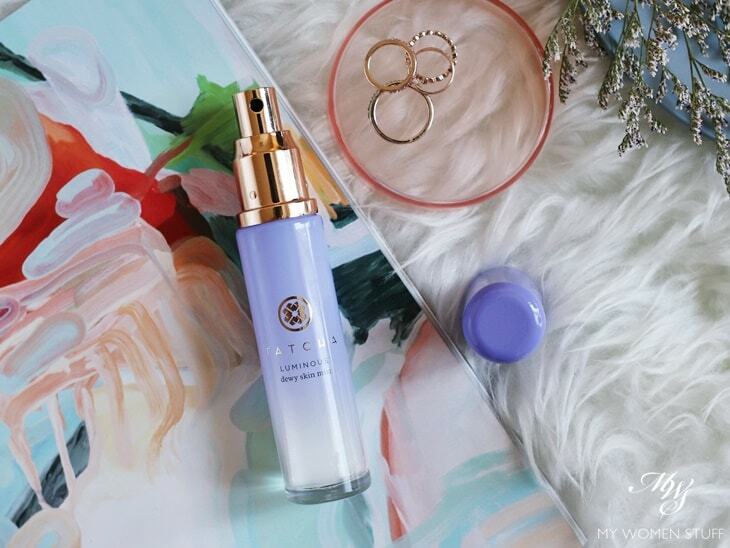 A full sized Tatcha Luminous Dewy Skin Mist is only 40ml, which is tiny! Most full size facial mists weigh in at at least 100ml bottles because you will use a lot of it – even La Mer’s mist is 100ml. So at 40ml, and if you see the slim bottle above, it is almost as much content as found in a bottle serum. You can also see from my picture above, that I am almost through with my bottle. I cannot remember how long it has been since I started using it, but it has to be about a month ago at least. I am quite liberal in my use, as I did not want to skimp merely because of how much it costs. I like to use my skincare as much as my skin will tolerate, so I am always generous. Whether it is worth it, is therefore debatable. While you can use it for a myriad of uses, like most facial mists, I’d skip using this to set your makeup, or to mist throughout the day, to refresh skin. Use something more affordable for that, because it really does cost too much to be frivolous with its use. TIP: Click here to learn about the moisture sandwich technique and why you need it in your skincare routine! I’m not sure. I do like it, and I love the construction of the bottle. But it is a little rich for my wallet. So maybe I will, if I come across a good deal, but not otherwise. The Tatcha Luminous Dewy Skin Mist is a facial mist that comes in a slim glass bottle, with gradient purple colour. You can see the milky white liquid of the mist at the bottom of the bottle. The gold spray nozzle deserves special mention for spraying out the finest mist I’ve ever experienced! It is sublime. The texture of the Tatcha mist is also a little “heavier” than most water-type mists. So it “sticks” to skin a little better, and it keeps it hydrated and moisturized with its oils, hyaluronic acid and humectants in the formula. Remember to shake it up before using. I do enjoy using it a lot, and I have found it very helpful for my skin when it needs more moisture. But because of its price tag and small quantity, I am hardpressed to repurchase. For those interested, this is the ingredients list for the Tatcha Luminous Dewy Skin Mist. Have you tried this Tatcha Luminous Dewy Skin Mist? Do you use facial mists? NEXT POST: Feeling a lot of love for The Herb Farm Hydrating Overnight Face Mask – better late than never! You hit the nail on the head… not enough of these mists in the market. And they are popular. Yay, so glad you got to try the mist Paris! ? It’s funny though, I use it to set my makeup and keep my skin look dewy and hydrated (no powder in sight please!) but I should give it a go in the mornings, during my skincare routine. Something else you might find funny, after forcing myself to use up a Jurlique Intense Rose Water Mist, I’m really ‘craving’ going back to basics with my mists (the Caudalie Grape Water or even a thermal water mist). I seem to be over highly scented skincare which is sometimes hard to decipher too! Hi Paris. Thanks for the review. I’ve been very curious about the Tatcha luminous mist for ages but more for the glow aspect than the hydrating one. You’re right, it isn’t easy to find so I gave up. The products I use to give me my dewey look : Mac strobe cream under foundation and prep + prime mist before and after). My favourite regular water mists are : Caudalie grape and Avene Thermal water. 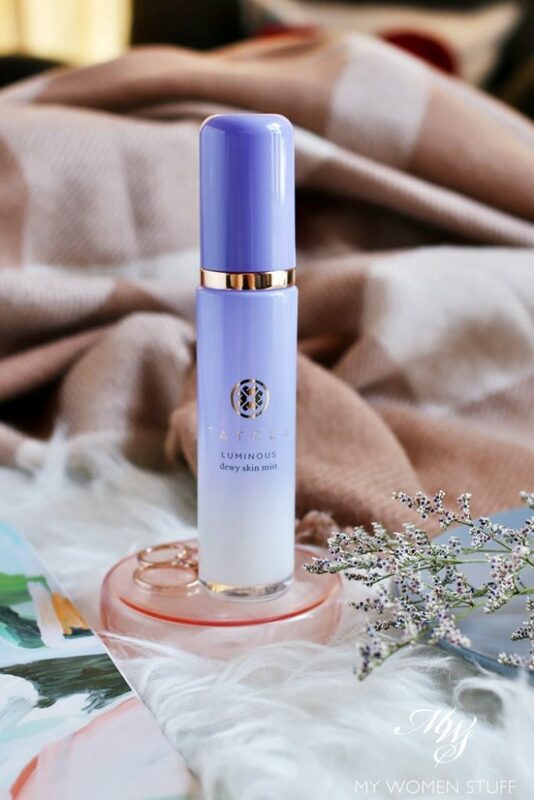 Institut Estederm – Cellular Water Spray is by far the most hydrating of all the water mists I’ve ever tried but like Tatcha it’s pricey and not sold everywhere. During the day I usually top up my sunscreen with La Roche-Posay spf 50 mist – the titanium dioxide particles in it keep the dew going with protection as added bonus. Caudalie Beauty Elixir (all the rave a few years ago) is the worst product in this category due to the high concentration of essential oils and alcohol – both drying and irritating not to mention photosensitive. I would love to see you do a comparison of all of these mists (hydrating and dewey) sometime ! Hi Kristine! I am so with you about the Caudalie Beauty Elixir. I really dislike it and it stings my eyes! I also find that it tends to go off fairly quickly! I do love the Grapewater Mist though and it’s been a staple forever! One of my other luxury mist favourite is Tata Harper’s Hydrating Floral Essence. It costs eleventy thousand pounds but has the most beautiful scent and feel on my skin. But my most go to mist is Josh Rosebrook’s Hydrating Accelerator, it seems to calm my mind as much as it calms my skin. Hi Lezel, So glad to see someone has had the same experience as me with horrible Beauty Elixir. I actually had nozzle problems and couldn’t get the darn thing to squirt anymore too. Pure rubbish. Thanks for TH and JR recs. I’ll definitely keep them on my radar now. Hi Kristine, I’m 100% with you on the Caudalie Beauty Elixir! I tried it because it was so highly raved, but found nothing good to say about it, and it in fact, put me off using facial mists for a while. I later found that it sets makeup very nicely (for some reason, better than most mists) so if I have a bottle, I use it for that, but I won’t buy it otherwise. Their Grape water spray however, is excellent! My first Tatcha’s purchase is the rice enzyme powder. It’s a scrub n like what u said, the products r not cheap at all. But, it lasted me almost a year now! I haven’t tried this mist spray & after reading your review, I’m curious now =D I might give it a try when I travel to places with Tatcha in Sephora.